Why don’t tomatoes taste the way they used to? This is the most common question people ask us about tomatoes. That’s why we’ve introduced a balance of technology, skill, and variety to grow tomatoes the way they should be - naturally tasty. But don’t take our word for it, try them for yourself. We use a safer and more sustainable medium to grow our tomatoes. While soil is most common, we use Rockwool - made from a rock fibre that it is reusable and provides roots with the ideal environment to flourish. Excess run off water is also collected and reused to maximise water efficiency and at the same time creating a safer alternative to soil, which has the potential to carry bad bacteria and fungi. This way, all the goodness gets to the plant and isn’t reserved in soil. Our greenhouse, located in Al Ain uses up to ten times less land than an open field farm ensuring your produce doesn’t need a mini passport to travel the world to get to your table. We savour every drop of water for our plants, making sure they get exactly the right amount of nourishment through drip irrigation ensuring that anything not used by the plants is recycled and and reused. 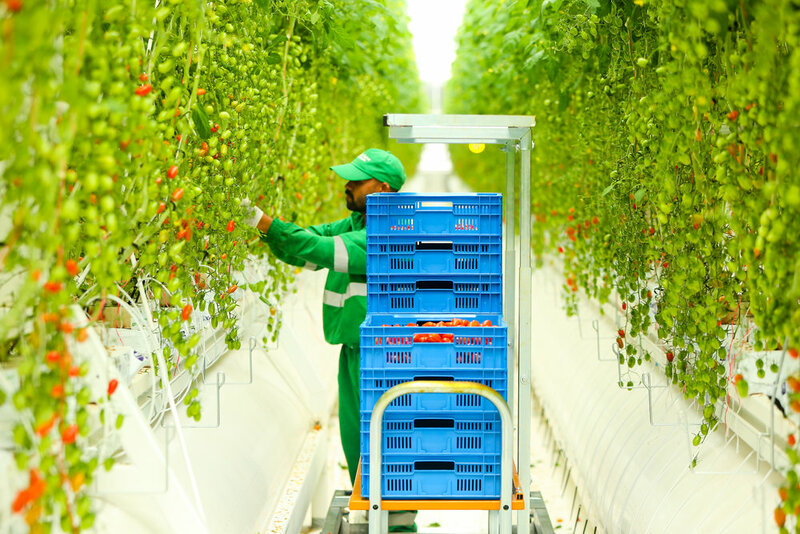 It’s why we are one of the most advanced controlled tomato growing facilities in the UAE. We find nature knows best when it comes to protecting plants, so we let insects like ladybugs do their work and fend off any harmful insects without us having to use chemicals. As well as being home to the growing of fresh produce, our greenhouse is home to bumblebees that pollinate our plants naturally. They're very busy bees - they have a 99.99% pollination rate and can visit 10,000 flowers per day. We don’t believe in speeding up the ripening process to increase the speed in which we pick our tomatoes. Instead, we’ve developed a more efficient and ergonomic way of growing and harvesting. 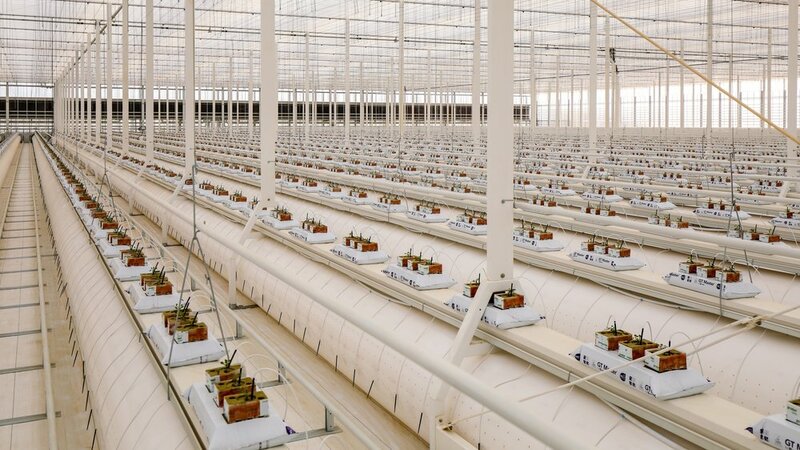 We grow our plants so they naturally lean, wrapping around greenhouse rows so we can harvest at eye level, the quickest way to vine-ripened perfection. All Mahalli seeds are non-GMO verified, which means all our produce is developed by natural plant breeding and not genetically modified in any way. We have travelled the globe for the finest flavours so we can grow the world’s tastiest tomatoes, all year round. You can track every tasty Mahalli tomato right back to its source because we believe in 100% transparent farming. Our harvest information is your information. Thanks to our hi-tech greenhouse we can even identify which row your tomatoes came from, we just don’t have time to give every tomato a name. But don’t let us stop you. Mahalli quality never slides. Our tomatoes are as delicious in June as they are in December. Greenhouse cooling technology means 365 days of tasty, fresh tomatoes available at most retailers. Nobody likes wasting food. Because we nurture our plants to such a high quality our tomatoes have an excellent shelf life. And, because we’re your neighbours, our tomatoes keep better for longer. But only if you can successfully hide them from everyone else.